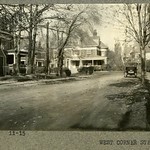 Corner of Beals St. The Dutch-design influenced #373, along with #375 (on the right), were built in 1899; designed by architect Walter Kilham. Looking NE from Corey Hill. Harvard St. bisects the photo from left to right. 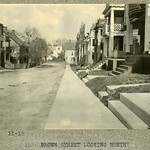 Below Harvard St., center left, is Kenwood St. and center right is Columbia St., both newly created. 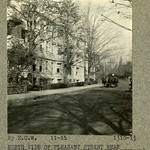 Above Harvard St., in the center of the photo, is the large house on the estate of James F. Ayer. 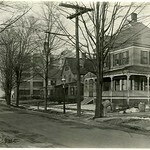 Bordering the estate on the right, is Thorndike St.
Viewed from Babcock St.; top of Summit Ave. in the distance; houses on Naples Rd to the right; Rear of the Gallagher house (still stands) on the left which faces Devotion St. across from the old Devotion firehouse. Babcock Hill was leveled to fill in Babcock Pond making way for new developments. David Sullivan Coolidge House, 470 Harvard St.
Coolidge's Corner, the original name of Coolidge Corner, was named for the Coolidge & Brother store he built for his younger brothers William and George on the northwest corner Harvard and Beacon Streets. David's son, Henry, lived at 488 Harvard St. Looking north toward Freeman St.
House of W. J. Sullivan, still standing. 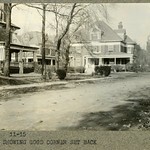 Houses on Osborne Rd., still standing, are visible to the left. 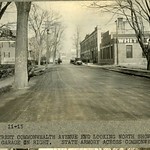 Looking from Winslow to the Brighton border at Commonwealth Ave. Only the factory building remains. Looking north from John St. Houses foreground right are no longer standing. Apartment building at 69-71 Babcock St just before Dwight St. and the house across the street at 80 Babcock St. remain. All houses still standing. 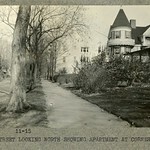 Photo rear, l to r: 23 and 17 Manchester Rd. Foreground left: partial view of 120 Stedman St. followed by a side view of 28 Manchester Rd. on the corner. Looking west from Powell St. Built in 1904 and designed by Loring & Phipps. Still standing. Pleasant St. & Browne St. Looking north across Beacon St. at the James Stearns property from the Thomas Sears house on Charles St. Foreground: greenhouse and carriage house of James Stearns. Middle ground left: house of James Stearns. 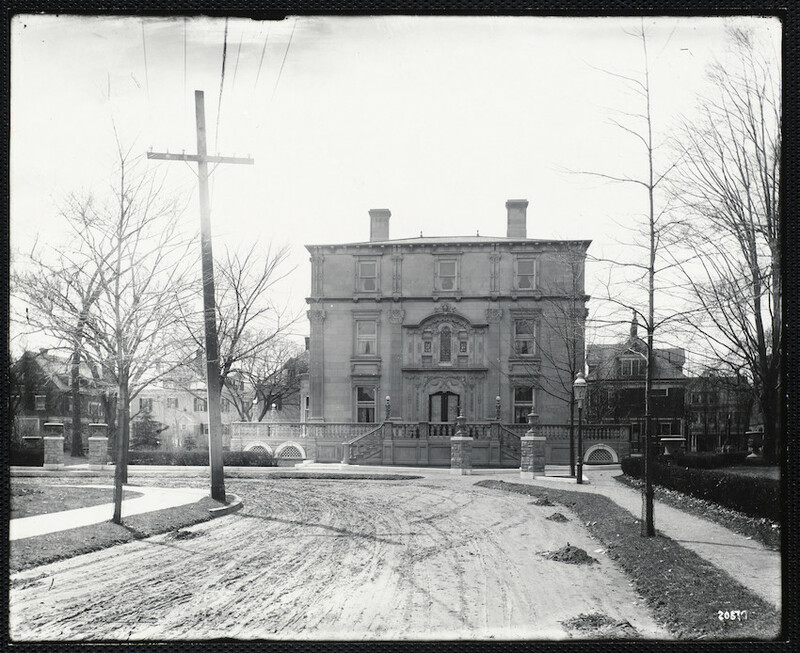 Rear: two houses on Browne St. Left is the house of McPherson LeMoyne with an entrance at 93 Pleasant St. and right is the house of the James family at 52 Browne St. 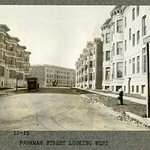 Looking north toward Commonwealth Ave. Buildings on the right are incorporatd into a modern-day composite building. House foreground right is still standing. The 101st Field Signal Battalion Corps was a unit in the 26th Yankee Division of the National Guard of Massachusetts. They reported for WWI duty on July 25th, 1917. In preparation for their deployment to France, they set up camp in this open field bounded by Dummer St. and Egmont St. that was then the playground of the Noble and Greenough School (located one block to the south). 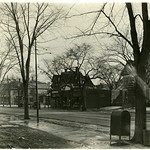 In the center of the photo is the house of James and Nora Ryan at 127 Egmont St. At the extreme right of the photo, barely visible above the tent, is a building on Dummer St., corner of Pleasant St., that still stands today, albeit greatly modified. The photographer would have been standing in the area of St. Paul St. looking west. The unit left its encampment for France in early September.